I’m a professional geologist and geographic information systems professional with a specific interest in karst hydrogeology. As a native of Tennessee, I have developed a deep appreciation for the caves and karst of the region. 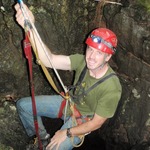 An alumni of the Western Kenutcky University Geosciences program (MSc), I gained a wide range of experience ranging from dye tracing, cave mapping, and karst geophysical surveys. I continue to be passionate about documenting and protecting karst resources by mapping cave systems, conducting hydrologic investigations, and developing innovative graphics with geographic information systems software. High Flow on the Plateau! Fully Funded!!! ...and then some! TTU Golden Eagles Swoop In! Hi Mark! Thanks for your support. We have a working list of springs on our radar from literature reviews and discussions with other karst scientists and cavers. We'll be releasing more updates as we establish our new spring sites and ultimately documenting our findings (discharge data and range of flows). The "major" spring question is a good one and gets to the heart of why we are doing this research - there is a lot yet to be learned about the hydrology in these groundwater basins. Our general criteria is to target Tennessee springs with the highest discharges. We've done our homework and many hours of field reconnaissance to help us decide where to focus our efforts (the larger TN springs based on information/observations to date). We are in the final stage of prioritizing sites for continuous monitoring stations and you'll be seeing updates pretty soon to show you our monitoring network. Thanks again for your support! Whoa!!!! You put us over the top! We've reached our goal! Thanks SO much!!! Thanks SO much Nashville Grotto! We really appreciate your generous donation! Thanks Brian! We'll be hitting it hard in the coming year, so we appreciate the offer. Hopefully we can line up with your schedule sometime. We'll definitely keep everybody updated and we really appreciate your donation. Thanks for the support and donation, Chuck! Thanks so much Evan and TTU! We really appreciate the high level of support that TTU faculty and students are offering for the project. Thanks Kirk! We're really excited about the project and appreciate the help! Thanks for the support! We really appreciate it! Bob, we are card-carrying karst compadres continuing the quest to create a consortium to calculate and characterize karst catchments. We picked up your name from a cave register and figured we’d be remiss if we didn’t include you on information related to the project. ;) Thanks SO much for the generous donation!